Ashtami - Why is Ashtami the most important day during Navratri? / Why is Ashtami the most important day during Navratri? Why is Ashtami the most important day during Navratri? Ashtami is one of the most important days in Navratri and devotees undertake fasts to please Maa Durga on this day. But why is Ashtami so important? Ashtami during Navratri has multiple significances. Here we discuss some of them to know why Ashtami is highly venerated during Navratri. Ashtami, the eighth day of Navratri is also known as Astra Puja and known as Virashtami. This is because all weapons are propitiated and worshipped on this day along with a display of martial arts. As an answer to the prayers of gods and humans, Ma Durga decided to annihilate the demon Mahishasura, the buffalo faced giant. As she prepared for the war, all the gods gave their divine weapons and powers to Ma Durga. All those weapons were worshipped and handed over to Ma Durga on the day of Ashtami and therefore the day came to be called as Astra Puja. Another name ‘Virashtami’ attributed to this day heralds the courage and valor of ma Durga. On the day of Ashtami, Ma Kali emerged from the face of Durga. In addition, Ashtanayikas or the eight aspects of Durga emerged from her and assumed their roles in the war. Therefore on the day of Ashtami, the war with Mahishasura gained full momentum and force. 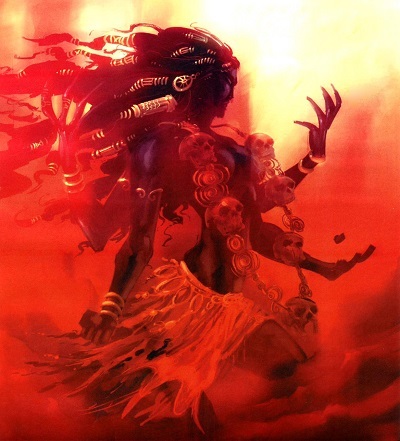 There was a fierce battle between Kali and the demons Chanda, Munda and Raktabhija. As part of the Navratri puja, Ashtami is so significant in worshipping the 64 Yoginis, Ma Kali, Ma Durga and the Ashtanayikas. The eight aspects of Durga that emerged from her and assumed distinctive forms and names include Brahmacharini, Maheshwari, Kameshwari, Vaishnavi, Varahi, Narasinghi, Indrani and Maa Chamunda. Each of these aspects signifies a particular attribute of Ma Durga. The puja done on the day of Navratri Ashtami is meant to propitiate all the aspects of Ma Durga together and there it is highly significant. It is believed that Ma Durga manifested on Ashtami day. Month on month, special pujas are performed to Ma Durga on Ashtami. The Ashtami falling during the Navratri festival is called Maha Ashtami or Maha Durga Ashtami. This is also the second day of the last set of three days of Navratri dedicated to worshipping Ma Durga. On Maha Durga Ashtami Durga is propitiated with an elaborate puja. Ashtami and Navami are auspicious days to celebrate the essence of womanhood. Therefore on this day Kanya Pujan is observed by Hindus across India. Click on Kanya Puja on Ashtami or Navami to offer this special Puja to Maa Durga this Navratri. Usually nine girls who have not attained puberty are invited to homes and their feet are washed. They are considered to represent the nine forms of Durga namely Shilaputri, Brahmacharini,Chandraghanta, Kushmanda, Skandamata, Katyayani, Kalaratri, Mahagauri, and Siddhidatri. They are presented with delicious food and some nice gifts which are believed to propitiate Ma Durga. In many regions, it is believed that on Ashtami, the eighth incarnation of Maa Durga namely Maha Gauri took birth. She is the symbol of her devotees’ welfare. She is the problem solver and bestows good health, good life, and happiness on all. The most famous Sandhi puja connected to Navratri is observed on Ashtami. This is the time when the Ashtami tithi ends and the Navami tithi starts. At this juncture, Balidan or sacrifice is offered to Ma Durga. Since animal sacrifice is prohibited for the Hindus, a symbolic Balidan consisting of cutting vegetables like pumpkin is done on this day.